Context: Role of Ozurdex in macular edema due to various posterior segment pathologies. AIM: The aim of this study is to report outcome of Ozurdex implant in macular edema (ME) secondary to various posterior segment pathologies. SETTINGS AND DESIGN: This was a single-center, retrospective, interventional study. SUBJECTS AND METHODS: Patients of ME were treated with one or more Ozurdex implants (0.7 mg). Data collection included demographic details, best-corrected visual acuity (BCVA), central foveal thickness (CFT), duration of efficacy, and record of adverse events (if any) within 24 weeks. STATISTICAL ANALYSIS USED: Paired sample t-test, Stata data analysis, and statistical software, version 12.1, StataCorp, College Station, TX, USA, were used in the study. RESULTS: One hundred and sixteen eyes of 104 patients were studied which had a diagnosis of diabetic ME (n = 46), retinal vein occlusion (n = 40), and uveitis (n = 30). The average age of patients (mean ± standard deviation) was 50.2 ± 21.9 years. Baseline mean ± SD (standard deviation) logMAR BCVA, CFT, and intraocular pressure (IOP) were 0.636 ± 0.4, 527.8 ± 210.1 μm, and 15.3 ± 3.8 mmHg, respectively. The reinjection interval was around 12–18 weeks. Ozurdex proved its efficacy in improving mean logMAR visual acuity and reduction of CFT from baseline till 12 weeks' follow-up period (0.414 ± 0.5 and 301.5 ± 278.5, respectively; P < 0.05), and after 12 weeks' follow-up, it started worsening (0.530 ± 0.9 and 444.8 ± 375.2, respectively; P > 0.05). The most common reported adverse event was significant rise of IOP (>5 mmHg), with a total of 12 cases followed by cataract 9 cases. CONCLUSION: Ozurdex implant leads to a significant improvement in BCVA and CFT values till 12 weeks, followed by a gradual decline for all the pathologies studied together. No new safety concerns were observed with the Ozurdex implant. The duration of efficacy was found to be <24 weeks. Posterior segment pathologies such as diabetic retinopathy, retinal vein occlusion (RVO), and uveitis can cause macular edema (ME), culminating in significant deterioration of central vision., The tight junctions between the retinal pigment epithelium and also the retinal vascular endothelial cells are responsible for maintaining a sealed blood–retinal barrier. There occurs an upregulation of vascular endothelial growth factors, inflammatory mediators such as interleukin-6, and prostaglandins, secondary to an insult caused by various posterior segment pathologies, which disrupts the sealed blood–retinal barrier, leading to ME through increased capillary permeability.,, Corticosteroids possess beneficial effects due to their anti-inflammatory, anti-permeability, and anti-angiogenic properties, through which they combat the aforementioned pathophysiological insult. With the objectives, to evaluate anatomical and functional outcome, to assess efficacy and safety parameters, of Ozurdex in ME, a retrospective study was conducted, among Indian subset of population, in a tertiary care clinical setting. This was a single-center, retrospective, open-label, interventional study with data collected from patients with ME secondary to various posterior segment pathologies, treated with one or more Ozurdex implant (0.7 mg), and provided informed consent to be enrolled in study. The synopsis was reviewed, and ethical approval for this study (Ethical Committee P° PNN 198) was provided by the Ethical Committee and Institutional Review Board of Retina Foundation, Ahmedabad. Patients recruited through the retina clinic from February 2013 to July 2016, were enrolled in the study, and were assigned a registration number, and no patient-identifiable information was collected. The study adhered to the tenets of the Declaration of Helsinki. Data were collected under the following headings: demographic details, history of presenting illness, eye laterality, history and duration of diabetes, hypertension or any other associated systemic comorbidities, diagnosis of retinal pathology responsible for ME, lens status, previous ocular intervention, duration between last intervention and first Ozurdex implant, clinical examination details including visual acuity at presentation and follow-up with imaging, treatment details, complications (if any), and treatment given for that complication. Inclusion criteria were: (1) age >21 years, (2) presence of ME in the study eye secondary to any posterior segment pathology, (3) best-corrected visual acuity (BCVA) <20/25, (4) central foveal thickness (CFT) >250 μm as measured by spectral domain optical coherence tomography (SD-OCT), (5) follow-up of at least 6 months after the first Ozurdex injection was administered, and (6) complete availability of documentation till the last follow-up. If anyone of the above-mentioned inclusion criteria was not met, patients were excluded from the study. Patients who met inclusion criteria were enrolled in the study and underwent a complete eye examination which included BCVA with the help of Snellen chart, color fundus images (Topcon 50 Dx, Medical Systems Inc, Oakland, NJ, USA), fundus fluorescein angiography (Spectralis, Heidelberg Engineering Inc, Heidelberg, Germany), and SD-OCT (Spectralis, Heidelberg Engineering Inc, Heidelberg, Germany). Previous treatments consisted of intravitreal injection of 1.25 mg per 0.05 ml of bevacizumab (Avastin; Genentech, South San Francisco, CA, USA) or 0.5 mg per 0.05 ml of ranibizumab (Lucentis; Genentech, South San Francisco, CA, USA) or pan-retinal photocoagulation or sectoral laser or intravitreal steroid injections (apart from Ozurdex). Ozurdex (Allergan, Irvine, CA, USA) injection was given as per standard protocol. During the entire study period, none of the patient received any concomitant treatment. In each case, follow-up data were collected on week, 4, 12, and 24. Any further follow-up data (if mentioned in records) were also noted. BCVA, color fundus images, and CFT values from SD-OCT noted during each visit were analyzed. 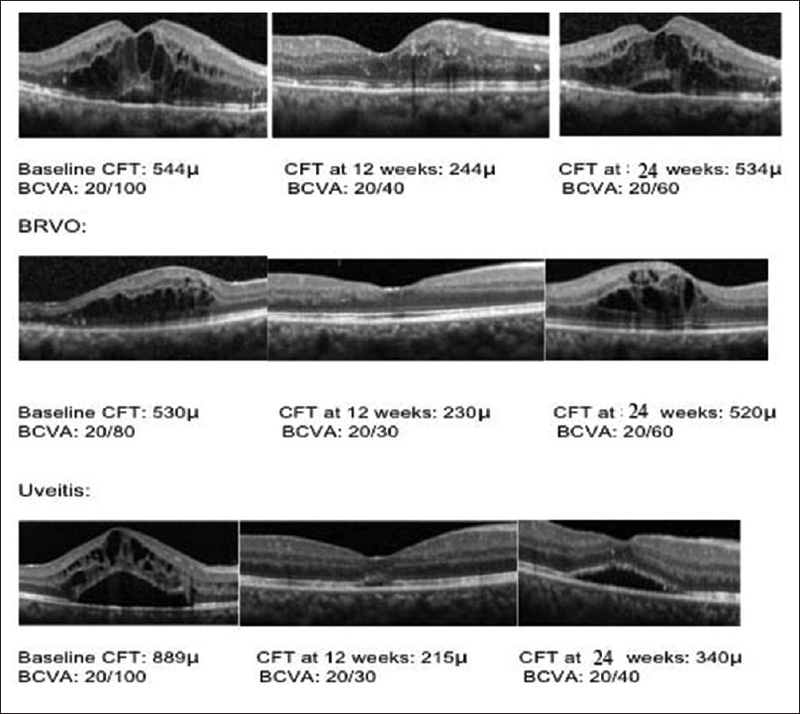 The criteria for defining treatment failure that required retreatment were as follows: Loss of BCVA of >5 letters (Early Treatment Diabetic Retinopathy Study) and/or an increase in retinal thickness in OCT of >100 μm. Adverse events such as cataract, significant rise of intraocular pressure (IOP) >5 mmHg, and injection-related adverse events were defined prospectively. Significant elevation of IOP was defined as an increase of more than and or equal to 5 mmHg compared to the baseline level. The decision to institute antiglaucoma therapy was made along conventional lines based on the degree of IOP elevation. None of the phakic cases for all pathologies included in the study had preexisting cataract. Lens Opacities Classification System III grading was used to grade the lens opacities during follow-up. The decision to perform cataract surgery with lens implantation was made in discussion with the patient, taking into account the level of vision in both the affected and fellow eye. All adverse event terms recorded in patient medical charts. Being an open-label study, most analyses were descriptive. For statistical analysis, Snellen's visual acuity values were converted into logMAR at baseline and the last follow-up. Descriptive statistics included sample size, mean, standard error (SD), median, minimum, and maximum. Variables were summarized in frequency and percentage tables. Paired sample t-test was used to measure mean differences between pre- and post-implant values of all the parameters evaluated and obtained at first and the last follow-up visits. Statistical analyses were performed using commercial software (Stata data analysis and statistical software, version 12.1, StataCorp, College Station, TX, USA). P value lay below 0.05 or 0.01, attained statistical significance (*) or high significance (**), respectively. The 95% confidence interval and statistical significance were analyzed using a generalized estimating equation model with a correlation structure. Various adverse events that occurred during the course of study were tabulated and computed using descriptive statistics. One hundred fifty-three eyes of 140 patients who received Ozurdex implant due to various segment pathologies were studied. Out of which, 116 eyes of 104 patients who met our inclusion criteria were included in the study and rest were excluded from the study [Table 1]. The average age of patients (mean ± standard deviation) for all the pathologies in our study group was 50.2 ± 21.9 years. Sixty patients were males and 44 patients were females. Twelve patients had bilateral retinal pathologies. Diabetes was the major comorbid condition affecting 52 patients (50%) followed by hypertension affecting 39 patients (37.5%). The most common retinal pathology encountered in our study group was DME comprising 46 cases (39.65%), followed by RVO 40 cases (34.48%) and uveitis 30 cases (25.86%). For all posterior segment pathologies, mean ± SD logMAR BCVA, CFT, and IOP at baseline were 0.636 ± 0.4, 527.8 ± 210.1 μm, and 15.3 ± 3.8 mmHg, respectively. 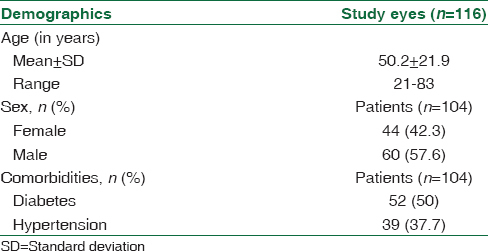 Overall 21 cases (18.10%) had pseudophakia at presentation of which DME, RVO, and uveitis comprised 10 (8.62%), 4 (3.44%), and 7 (6.03%) cases, respectively [Table 2]. DME and RVO were reported to be treated with intravitreal ranibizumab in 2.58% and 1.72% cases, respectively, and with intravitreal bevacizumab in 3.44% and 5.17% cases, respectively. Cases with uveitis were treated with posterior sub-Tenon's Kenacort injections in 2.58% cases. Lasers (focal/grid or panretinal photocoagulation) were done overall in 19 eyes (16.37%), of which DME comprised a majority of 11 cases, followed by RVO 8 cases. The minimum duration between previous intervention and first Ozurdex implant was at least 6 months. The overall mean (± SD) number of injections for study eyes was 1.0 ± 0.2, and individually with DME, RVO, and uveitis was 1.0 ± 0.1, 1.1 ± 0.1, and 1.0 ± 0.2, respectively. The overall mean duration of Ozurdex implant after primary intervention for ME was 7.5 months, and individually for DME, RVO, and uveitis was 7.3, 3.2, and 13.5 months, respectively [Table 3]. 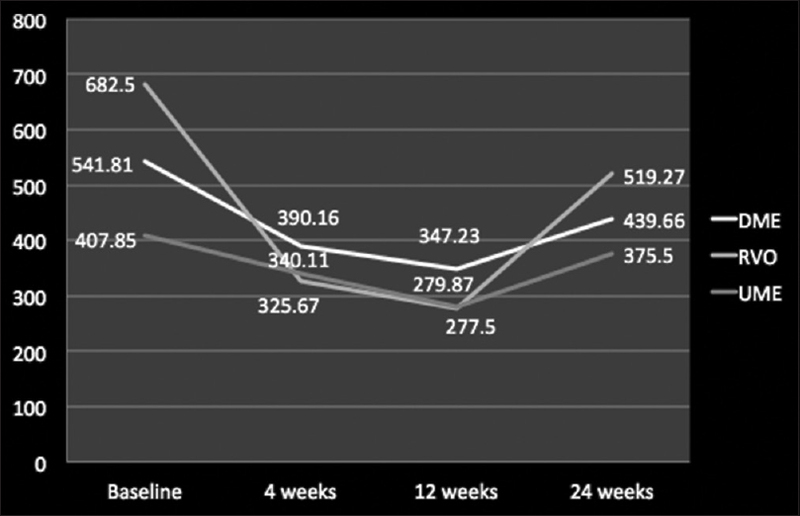 Overall, Ozurdex proved its efficacy in improving mean logMAR BCVA from baseline (0.636 ± 0.45) till 12-week follow-up period (0.414 ± 0.5) (P < 0.05), and after 12-week follow-up, it started worsening (0.530 ± 0.9) (P > 0.05) [Figure 1]. For DME, RVO, and uveitis, the mean logMAR BCVA improved from baseline till 12 weeks (P ≤ 0.05), and the amount of improvement was maximum in RVO, followed by uveitis and DME [Figure 2]. After 12-week follow-up, worsening or an increase in mean logMAR BCVA was seen which was observed more for DME, followed by uveitis and least for RVO. In terms of reduction of CFT and improvement in ME, as compared to baseline value (527.8 ± 210.1 μm), Ozurdex led to an overall improvement for all the posterior segment pathologies till 12 weeks (301.5 ± 278.5; P< 0.05), but after 12 weeks, there was a resurge in ME leading to rise in overall mean CFT values (444.8 ± 375.2; P > 0.05) [Figure 3]. Individually for DME, RVO, and uveitis the mean CFT value improved from baseline till 12 weeks which was maximum for RVO, followed by uveitis and least for DME, but after 12-week follow-up, there was an increase in CFT values in all the three pathologies signifying worsening of ME which gained a peak value for RVO, followed by DME and uveitis, respectively [Figure 4] and [Figure 5]. A total of 28 treatment-related adverse events were reported with Ozurdex implant in patients with a diagnosis of DME (19.56%; 9/46), RVO (17.5%; 7/40), and uveitis (40%; 12/30). The most commonly reported adverse event was increased IOP, with a total of 12 events, for DME (8.69%; 4/46), RVO (5%; 2/40), and uveitis (20%; 6/30 patients) [Table 4] and [Figure 6]. Overall, cataract was noted in 9 cases of which DME comprised 2 cases (22.22%), RVO 2 cases (22.22%), and uveitis 5 cases (55.55%). In each and every case, IOP was controlled with antiglaucoma medications. None of the cases, having raised IOP, required antiglaucoma surgery. All cases diagnosed as having cataract were managed surgically with cataract extraction and IOL implantation [Figure 7]. This study highlights the role of Ozurdex in ME secondary to various posterior segment pathologies in an Indian clinical scenario, a real-life situation. Several other studies describing various parameters such as morphological and functional outcome, efficacy, and safety profile of Ozurdex in ME have been conducted including various posterior segment pathologies individually but less as a whole. In Germany, a prospective study was conducted by Mayer et al. ; in 64 eyes of RVO patients. Out of which in Group 1, 38 eyes (22 central retinal vein occlusion [CRVO] and 16 branch RVO [BRVO]) received Ozurdex alone. The mean injection numbers were 2.4 among CRVO patients and 1.8 among BRVO patients over the 12 months of study period. They reported that BCVA improved by 6.6 (±1.7) letters in CRVO and 7.8 (±2.9) in BRVO patients. A large multicentric (167 clinical sites in 24 countries throughout the world) prospective study (Ozurdex Geneva trial that led to FDA approval of dexamethasone intravitreal implant [DEX] implant in RVO) was conducted in patients (at least 18 years of age) with BRVO and CRVO related ME (n = 1267) who received a single treatment with DEX implant 0.7 mg (n = 427), DEX implant 0.35 mg (n = 414), or sham (n = 426) and reported that the percentage of patients who experienced improvement in BCVA ≥15 letters (3 Snellen lines) was higher in DEX implant group, and also, the duration to achieve this gain was lower as compared to sham group.,, The study was also able to show that early treatment of ME was more beneficial than delayed treatment in restoring VA.
Chhablani et al. and Totan et al. in their studies have proven the role of Ozurdex implant in cases of DME and DME resistant to intravitreal bevacizumab treatment, in which DEX implant caused reduction in CFT and significant improvement in BCVA., The CHAMPLAIN study, a prospective, multicenter trial carried out in cases diagnosed as DME in a vitrectomized eye, has shown significant improvement in visual acuity (21.4% of diabetic eyes gained at least 10 letters, and 42.9% of eyes had improved at least 5 letters of visual acuity) and decrease in central macular thickness (27% at week 13 and 9.6% at week 26) after the DEX implant. The Ozurdex HURON Study group evaluated the safety and efficacy of two doses of DEX implant for the treatment of noninfectious intermediate or posterior uveitis and concluded that a single DEX implant significantly improved intraocular inflammation and visual acuity persisting for 6 months. Another retrospective study by Tomkins-Netzer et al. included noninfectious uveitis (27 patients, 38 study eyes) found that repeat DEX implant injections resulted in improved ocular function and retinal thickness and resolved inflammation. Totan et al. also reported that Ozurdex results in significant improvement in baseline BCVA and reduction in CFT in cases of chronic DME. Ozurdex has been approved worldwide for the treatment of RVO in 2011 and treatment of noninfectious uveitis affecting the posterior segment of the eye in 2012 and is recently approved for the treatment of adult pseudophakic DME since 2015.,, Our study included eyes with ME that were treatment naïve and also which had been previously treated with some or the form of therapy. Based on the pharmaco biokinetic profile of the drug, the reinjection interval quoted for treating recurrent or nonresolving ME secondary to various posterior segment pathologies is 6 months. While our study found that for all posterior segment pathologies taken into account, there occurs a decline in mean CFT values and improvement in mean BCVA from baseline (527.8 ± 210.1 μm and 0.636 ± 0.4, respectively) till 12 weeks (301.5 ± 340 μm and 0.414 ± 0.2, respectively). At 24 weeks, a resurge in mean CFT values which was complimented with a decline in mean BCVA values (444.8 ± 210.1 μm and 0.530 ± 0.1) was observed which signifies that in a real-world scenario, the duration of efficacy or the pharmaco biokinetic profile of the drug is <6 months requiring a reinjection of Ozurdex in cases of recurrent and/or nonresolving ME before 6 months [Figure 1] and [Figure 3]. The most common adverse event was increased IOP (>5 mmHg) reported in 12 eyes post-Ozurdex implant, for DME (8.69%; 4/46), RVO (15%; 6/40), and uveitis (6.66%; 2/30) patients. Lowder et al. reported that in their study on any given follow-up visit, substantial increase in IOP (≥25 mmHg) occurred in <10% of treated eyes., These 12 study eyes were managed with one or two antiglaucoma medications and none of the eyes required >2 antiglaucoma medications or antiglaucoma surgery. Cataract was the second most common adverse event in our study comprising 9 eyes of which DME comprised 2 cases (22.22%), RVO 2 cases (22.22%), and uveitis 5 cases (55.55%). All these eyes underwent cataract surgery. When these posterior segment pathologies were studied individually, it was observed that mean CFT reduction from baseline at 12 weeks was maximum for RVO, followed by DME and UME, respectively (P <0.05). This gradual reduction in CFT continued till 24 weeks as compared to baseline for RVO, DME, and UME. However, when CFT values were compared among 12 weeks and 24 weeks, it was observed that there was a gain in CFT values at 24 weeks as compared to values at 12 weeks which was highest for RVO, followed by UME and DME, respectively (P > 0.05). These data suggest that Ozurdex implant works much better in RVO cases, followed by DME and UME cases in terms of reduction in ME or anatomical improvement. 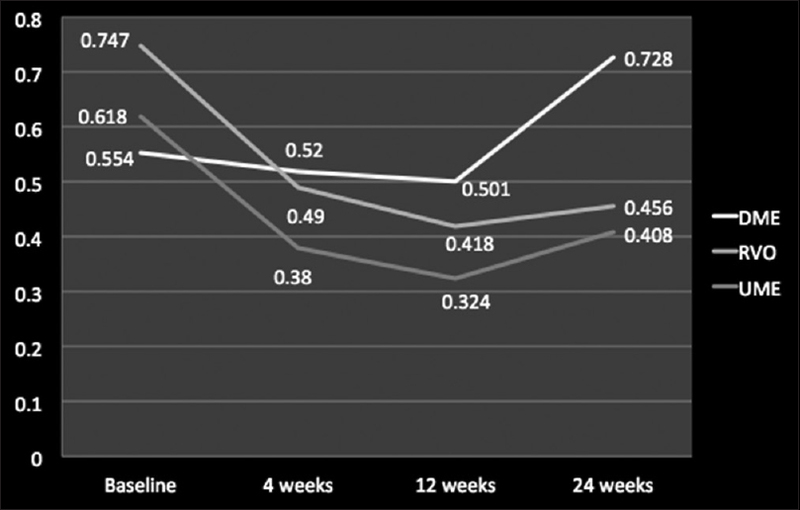 The amount of gain in mean CFT values is also much more in RVO cases at 24 weeks compared to 12 weeks which was followed by UME and DME cases, respectively, which signifies that the anatomical improvement attains its peak around 12-week period after which there is again a rise in CFT value indication reworsening of anatomical improvement [Figure 1] and [Figure 2]. In terms of individual analysis of mean logMAR BCVA for various posterior segment pathologies, an improvement till 12 weeks was observed which was highest in RVO cases, followed by UME and DME cases. However, at 24 weeks, this gain in mean logMAR BCVA was seen only for RVO and UME cases as compared to baseline values and deteriorated in cases of DME which was even more worse than the baseline value. This can be attributed to occurrence of macular ischemia and poor metabolic control of diabetes during study period in certain cases of DME. 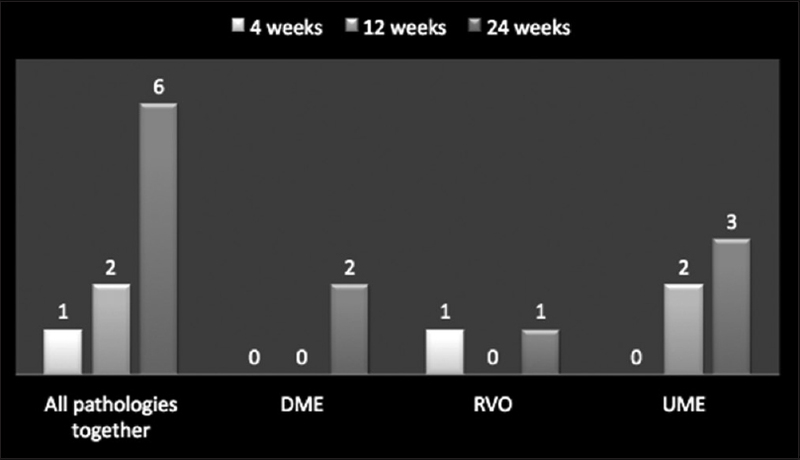 These data suggest that there is a improvement in mean logMAR BCVA or functional improvement till 12 weeks for all three pathologies which was maintained till 24 weeks only for RVO and UME cases, and DME cases had significant worsening around 24 weeks indicating that Ozurdex implant works best in RVO, followed by UME and least in DME cases. The functional gain reaches its peak around 12 weeks for all the three pathologies and then starts declining which is more for DME followed by UME and least in RVO cases. In conclusion, the results of our study provide new insight on the real-world scenario and effect of Ozurdex implant across various posterior segment pathologies (individually as well as when studied together). Ozurdex implant provided one-line to three-line gain in visual acuity from baseline, along with significant improvement in CFT values for all the pathologies. No new safety concerns were observed with the Ozurdex implant, and increase in IOP was easily managed with topical IOP-lowering medications. 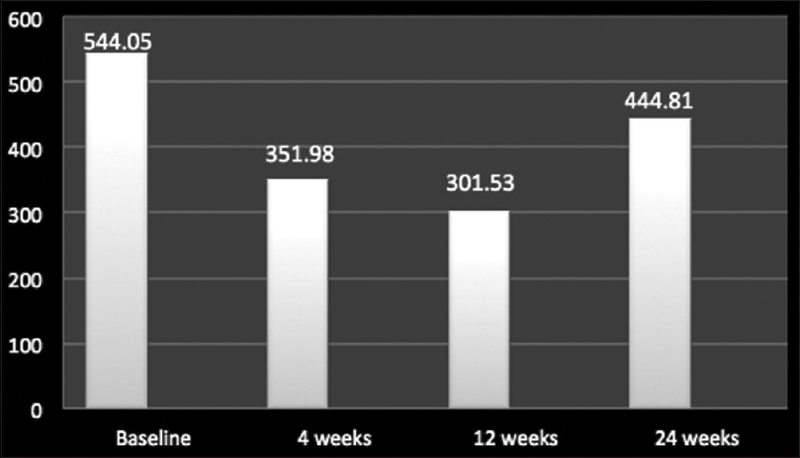 Apart from providing data on functional and anatomical improvement achieved, safety and efficacy of Ozurdex implant, this study also focuses on duration of efficacy of Ozurdex implant which was found to be <24 weeks as compared to manufacturer's quoted pharmacokinetic bioprofile (24 weeks). Although various forms of anti-VEGF therapies still remain the primary modality of treatment in ME secondary to various posterior segment pathologies, but in cases which do not respond optimally or have recurrence, requiring repeat anti-VEGF injections, Ozurdex is a potent and viable option and can also be considered as primary line of management. The major limitations of our study are its retrospective nature, less number of cohorts, and open-label design. The adverse events were limited to those reported on the medical charts. The cases of retinal venous occlusion were not studied subdividedly into branch and central vein occlusion and thereafter ischemic and nonischemic vein occlusion, which can provide further insight into cases of vein occlusion. Furthermore, follow-up data collection interval was fixed; therefore, evaluation was not possible to be done at specific time points. Hence, we recommend a longitudinal study encompassing all these posterior segment pathologies with larger number of cohorts in all subgroups to further validate our findings. The major strength of the study is that it provides data on Indian subset of population, and all three major posterior segment pathologies responsible for causing ME were taken together into account. Wolfensberger TJ, Gregor ZJ. Macular edema – Rationale for therapy. Dev Ophthalmol 2010;47:49-58. Kuppermann BD, Blumenkranz MS, Haller JA, Williams GA, Weinberg DV, Chou C, et al. Randomized controlled study of an intravitreous dexamethasone drug delivery system in patients with persistent macular edema. Arch Ophthalmol 2007;125:309-17. Sarao V, Veritti D, Boscia F, Lanzetta P. Intravitreal steroids for the treatment of retinal diseases. ScientificWorldJournal 2014;2014:989501. Hadayer A, Schaal S. Delivery of steroids into the eye for the treatment of macular edema. Expert Opin Drug Deliv 2016;13:1083-91. Ozurdex (Dexamethasone Intravitreal Implant 0.7 mg). [Product monograph]. Markham, ON, Canada: Allergan Inc.; 2015. Mayer WJ, Wolf A, Kernt M, Kook D, Kampik A, Ulbig M, et al. Twelve-month experience with Ozurdex for the treatment of macular edema associated with retinal vein occlusion. Eye (Lond) 2013;27:816-22. Lam WC, Albiani DA, Yoganathan P, Chen JC, Kherani A, Maberley DA, et al. Real-world assessment of intravitreal dexamethasone implant (0.7 mg) in patients with macular edema: The CHROME study. Clin Ophthalmol 2015;9:1255-68. Gillies MC, Lim LL, Campain A, Quin GJ, Salem W, Li J, et al. A randomized clinical trial of intravitreal bevacizumab versus intravitreal dexamethasone for diabetic macular edema: The BEVORDEX study. Ophthalmology 2014;121:2473-81. 9. Chhablani J, Bansal P, Veritti D, Sambhana S, Sarao V, Pichi F, et al. Dexamethasone implant in diabetic macular edema in real-life situations. Eye (Lond) 2016;30:426-30. Totan Y, Güler E, Gürağaç FB. Dexamethasone intravitreal implant for chronic diabetic macular edema resistant to intravitreal bevacizumab treatment. Curr Eye Res 2016;41:107-13. Lowder C, Belfort R Jr., Lightman S, Foster CS, Robinson MR, Schiffman RM, et al. Dexamethasone intravitreal implant for noninfectious intermediate or posterior uveitis. Arch Ophthalmol 2011;129:545-53. Tomkins-Netzer O, Taylor SR, Bar A, Lula A, Yaganti S, Talat L, et al. Treatment with repeat dexamethasone implants results in long-term disease control in eyes with noninfectious uveitis. Ophthalmology 2014;121:1649-54. Haller JA, Bandello F, Belfort R Jr., Blumenkranz MS, Gillies M, Heier J, et al. Randomized, sham-controlled trial of dexamethasone intravitreal implant in patients with macular edema due to retinal vein occlusion. Ophthalmology 2010;117:1134-46. Haller JA, Dugel P, Weinberg DV, Chou C, Whitcup SM. Evaluation of the safety and performance of an applicator for a novel intravitreal dexamethasone drug delivery system for the treatment of macular edema. Retina 2009;29:46-51.